Dave just a FYI I just completed my Kickstarter survey (backer 50 Whoo!) and the EU VAT Paypal email address is a required field. I'm an Aussie so based on the question instructions it seems like it should have been left blank. I had the same problem after selecting "No, please direct ship" I had to put an email address in - hopefully the email will just be ignored. Yep, I goofed that, backers should have got an email explaining the goof. The field will be ignored for all those who didn't click yes to the previous question. - got taxed an expected 19% + EUR 0.50 per day of storage at the customs office. They hold it up to 14 days before sending it back. Optionally DHL offered to do the customs and pickup for EUR 28.50 + taxes and import. I´d rather pay the VAT upfront and have it sent directly. I reckon 90% of Kickstarter surveys that ask for anything more than a shipping address have similar issues with mandatory fields. I suspect the KS survey creation tool needs a overhaul, just like their comments section. I couldn't believe it was exactly the same as I used it several year ago. So inflexible it's not funny. Being able to only run one survey and not edit it in any way once sent. It's like it hasn't evolved at all. Apparently there are a ton of 3rd party plugin programs available to do more, and the logistics houses ask us what "backer tool" we are using. When we say none, it's like "oh, ok". Good work with the project! From Gold Coast QLD. I have 116 backer that have failed credit card processor, that's more than 5%. Was more than 7% before, but it's come down a bit. Those backers have 7 days to fix before the system drops them as non-payers. Any idea why I can't see the survey? Didn;t receive any notice from KS that I had an issue with the payment, and my bank told it was completed OK.
What pledge level? Surveys go out by pledge level, so Dave may have only sent the surveys for December deliveries. Kickstarter checks what you receive emails by tagging then with unique images. Every few months they decide my address is no longer valid, as I don't bother to view the images on the spam they send. If you log into you account you can check if they have done the same to you. Somehow my CC company declined KS reservation that was pending, but after hitting pay second time it went ok, looks like some security feature kicked in. When all you've got is a hammer, everything starts looking like a nail.- Attrition. OK! Thanks. My pledge is Johnie B. Good. Don't think I received that e-mail. Have e-mails "project update" 1 thru 6 and "Response Needed! 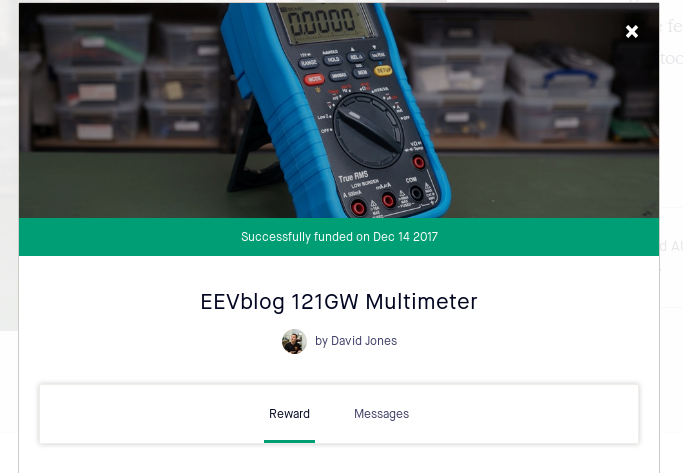 Get your reward for backing EEVblog 121GW Multimeter". There's a "Got It!" button in the reward tab that you can press when you receive shipment (I almost pressed it because quick glance I thought it was asking if I understood the reward page at first glance... 'Got It!'). Might be one time trigger....but maybe it can be deselected? Did the same thing too, you can deselect it at any time when that form shows up. That's just bad page design - and so incredibly easy to fix ... just change the text so there is no confusion. Kinda dumb. It would actually be cheaper to import into Australia and reship from here than reship from China, go figure. Ouch! I presume that is because you're importing from South Korea into China before shipping out to ROW? Just to say, I'm not a neurotypical individual. I saw this Kickstarter thing and thought I for sure need to back that project, however I manage to forget about it and now as I was about to back it I discover that I am 2 days late... I just wondered about how the future might look as for the availability for acquiring one of these multimeters now as the Kickstarter has ended? The first batches seme to be sold but you can be sure that this meter will find it's way in Daves shop http://www.eevblog.com/store/. Is the EEVblog.bin file available now? Does the meter come with a card or will I have to supply it? It was previously indicated it comes with a card. @GabYoung92: That 'Got it!' is just a marker you can set and unset. Just click on the tick and your meter just got un-delivered ;-). It is for you to manage your projects. Kickstarter projects should have a graph of $ and number of backers so you can see the progress of interest in the item.